Keep Calm and Cake On! – Wait…are those…cookies?! Keep Calm and Cake On! old picture, from Wurstfest. But cute! Roomiesss! The Roomie has landed! Our apartment is now officially EPIC. And the fridge is fully stocked with deliciousness, hooray! Be prepared to read about lots of shenanigans that will most likely ensue, in the kitchen and otherwise. Or, if you’d like to witness it yourself, you can come stay in the closet/guest room. Yep. We have a guest room sized closet, be jealous.You can be like Harry Potter, in his cupboard! Except more awesome, since we’re WAY cooler than the Dursleys. 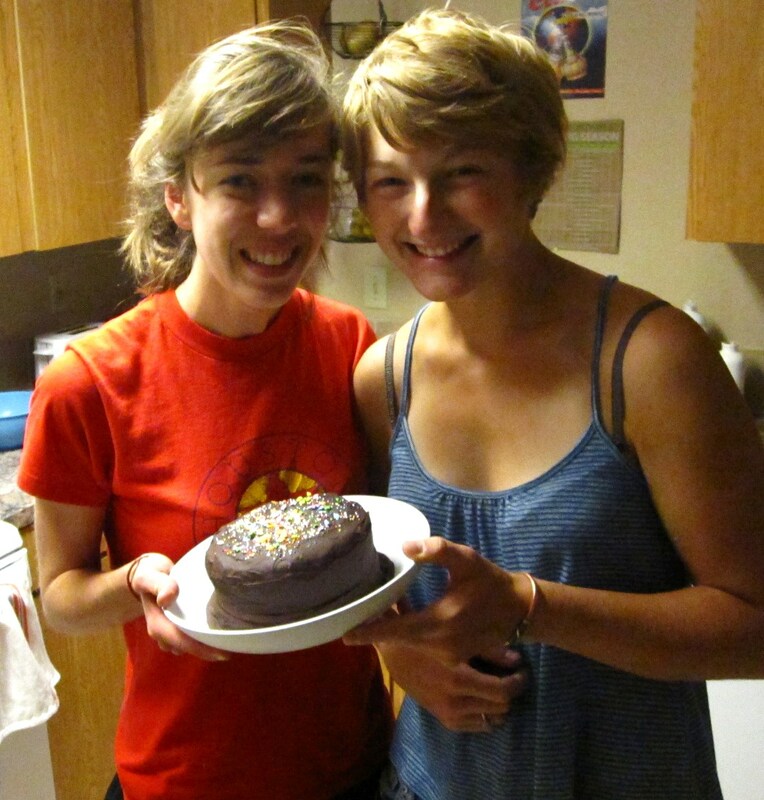 Because I was SUPER EXCITED that the Roomie (otherwise known as Kira, just so we’re all on a first name basis here…) was arriving, I decided to make… a CAKE! Of course. What else?! The only problem was that I made it Saturday… and she wasn’t arriving until Sunday night… which meant that I spent all of the time between wanting to eat it. Oops. But I didn’t! Willpower wins, so there! Take that gremlins! Be satisfied with your muffins and stop bothering me. Also, in the interest of my quest to utilize everything and not waste anything, I had my eye on some dangerously ripe buhhhnahhnnas (say it with a drawl or an accent, it’s much more fun!). Because why would you make anything else when you could make banana cake?! Besides, it’s only the BEST BANANA CAKE EVER, and who needs an excuse for that?! I certainly don’t. 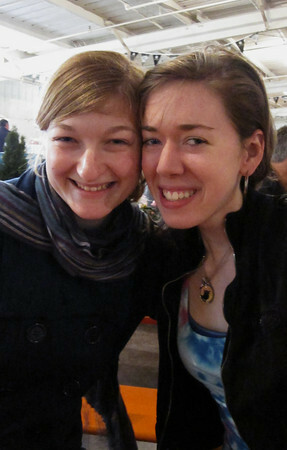 In fact, one of the besties at home (Michellleeee!!!) can vouch that this cake is epic. AND the Roomie like it. A lot. So YAY! Cake wins all around. Moral of the story: Make cake whenever possible. Or as the British government wisely said, Keep Calm and Carry On. Or, rather… in my case… Keep calm and cake on. Always! This cake is delicious. It’s simple, requires mostly what you have on hand in the pantry, and comes together in snap. Not only that, but it’s surprisingly light—a nap is not obligatory after finishing a slice :) The banana and chocolate flavors come together perfectly, and there is a perfect banana to chocolate ratio. It’s excellent with vanilla ice cream, of course (what isn’t ?! ), but also stands divinely on its own. I always refrigerate it, so the glaze stays hard, but it’s really good out of the fridge, so everyone wins. 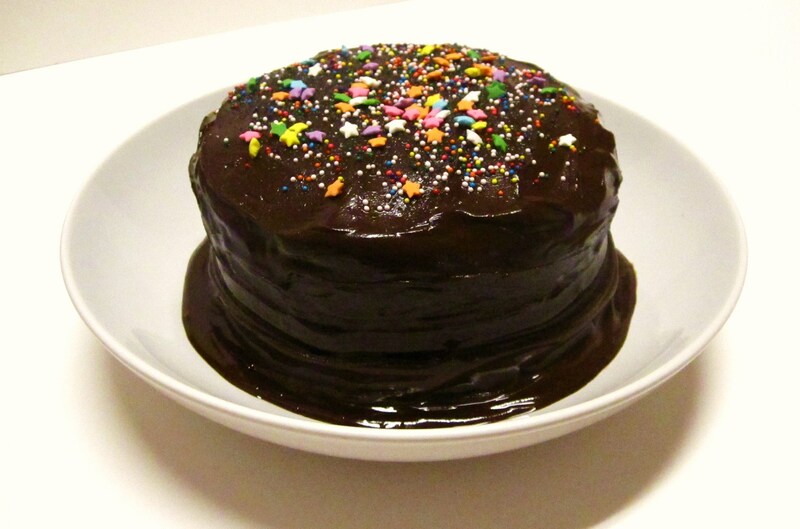 *I’ve also successfully made this cake in a half batch, with 1/2 c coconut sugar in place of the brown+white. I LOVE it this way, but up to you! Whisk together flour, baking powder, cinnamon, and salt. Using a hand mixer, cream the sugars and softened butter together until fluffy. Add in the eggs, one at a time, beating after each. Add vanilla and mashed buhnahnas. Mix again. Add in buttermilk and flour, alternating between the two, and starting and ending with flour. You can use your mixer for this too, which is obviously nice. Pour your batter into pans, and inhale the lovely banana aroma. Bake until golden and a tester comes out clean, about 35 to 40 minutes. (It’ll be less for the 6.5″ pans–unfortunately I’m not sure how long mine took. I set the timer for 20, and watched them carefully from there. I’m thinking about 25 total). Let cool in pans for at least 10 minutes, and then let cool completely before frosting. Keep Calm… and Sprinkle On? I think so. Top with sprinkles! Of course. What else?! This is why my gremlins are technicolor. 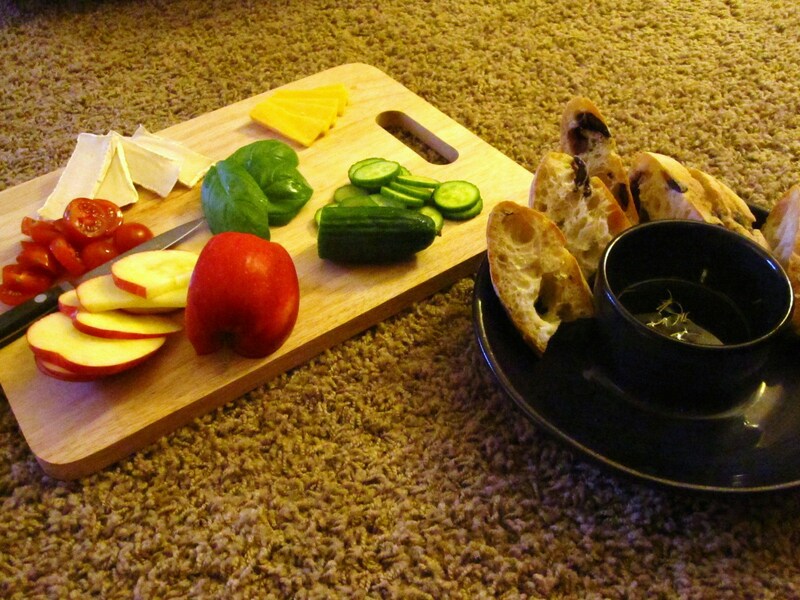 Enjoy with a fab roomie, who you are super excited to live with, after a really civilized picnic-style dinner of good cheese, crusty bread, fresh basil, and fresh veggies. YUM. I look like I’m about to fling the cake on the floor, oops! Do a happy dance because your lovely parents bought you a surprise for your 21st birthday on Friday! 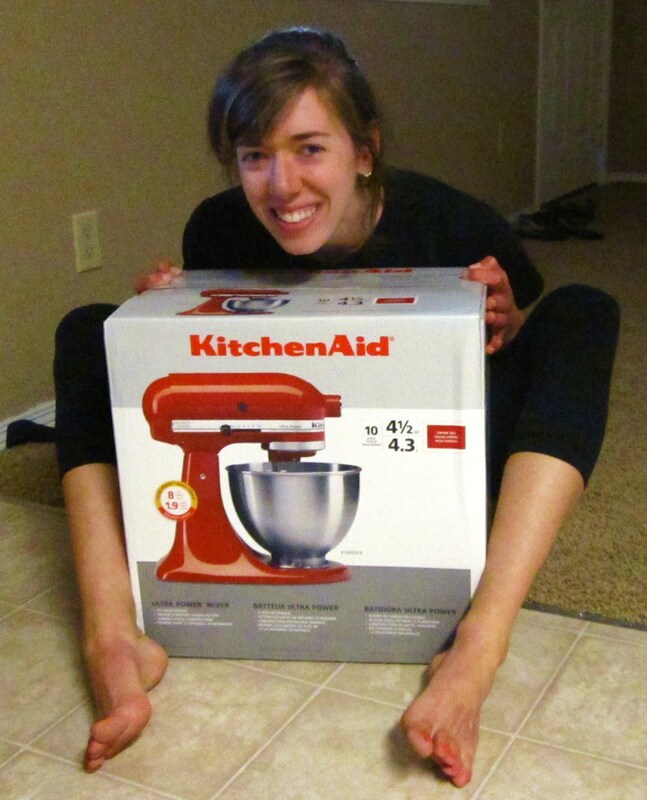 A RED Kitchenaide STANDMIXER! Happy, happy, HAPPY! Danke schoen, Mutti and Vati, you are quite possibly the BEST EVER! Kitchenaide, you are my new pet! 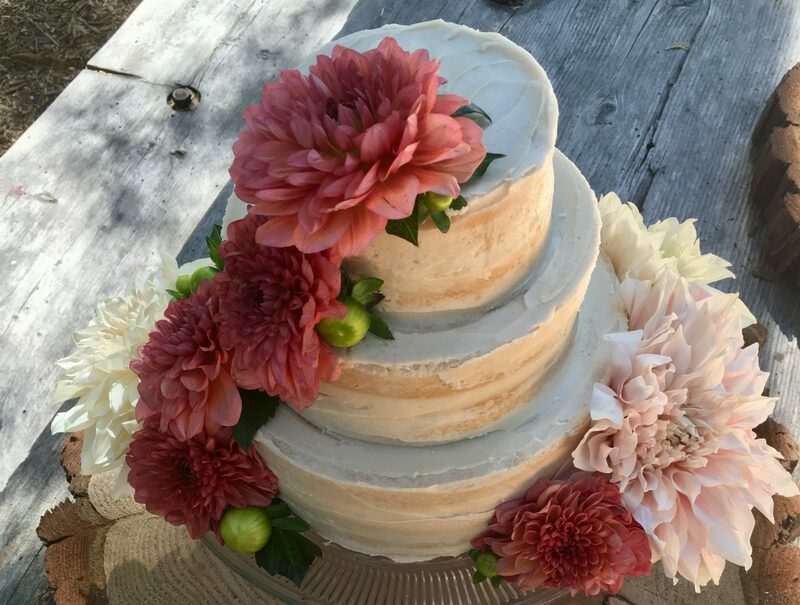 IT WAS SUCH A DELICIOUS CAKE! I think there is a math formula, as yet to be determined by you, that equates to more delicious treats with shorter bake times and smaller pans…..or something like that…..OK just eat. 1) Can’t wait to hear about shenanigans. 2) Way to wage war on gremlins! So…have you heard about my Watching Shakespeare While Eating Appropriately-Themed Cupcakes Society? 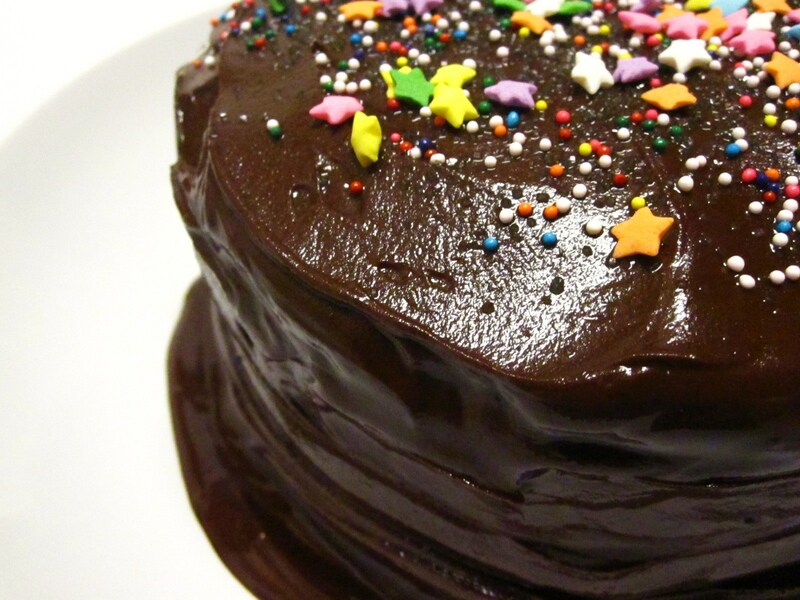 Because the connection between cake and awesomeness involves you, obviously. I should send you the invites just because awesomeness is best shared by mail, even if you are unable to attend because of “geography” or some such “science.” Anyway. We just went to see Ladybug do improvised Shakespeare and I improvised some epic black-bottomed cupcakes — check out my note on Facebook! Pingback: Second Breakfast for the most wonderful of advisors! | Wait…are those…cookies?! Pingback: Baking is my om | Wait...are those...cookies?! 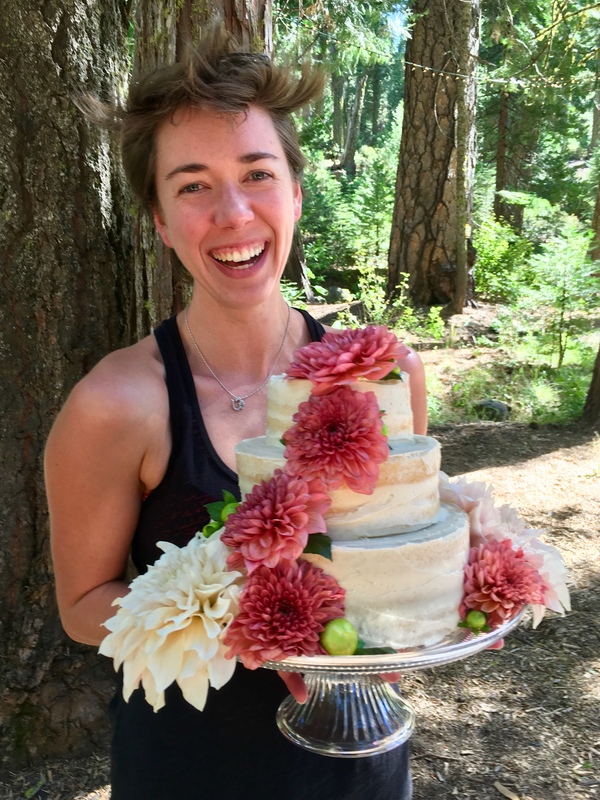 Pingback: Ode to Cake | Wait...are those...cookies?! Next PostNext Now Panic and Eat Cake!